Sunday Shorts: Why Is This President Smiling, and What Have Millennials Really Learned? Jack Goodman is constantly urging me to write more frequent, but shorter blog posts. In response, I’m introducing a new Sunday blog format, provisionally titled Sunday Shorts, that will touch briefly on political topics that I could not fit in during my longer posts during the week. This week’s short topics include Watergate, what explains Millennials’ growing distrust of the Presidency and why George H. W. Bush is a very happy 90-year old. Let’s begin with Watergate. On the 40th anniversary of its original publication, Bob Woodward and Carl Bernstein’s classic work of investigative journalism All the President’s Men is being reissued with an afterword by the two authors. Both appeared on Candy Crowley’s State of the Union show this morning and had some choice words for the state of investigative journalism today. Simply put, they believe news organizations put too much time and money into shows that specialize in political punditry, and not enough into traditional on-the-ground reporting. Moreover, in this internet-dominated 24-7 news cycle, journalists face increasing pressure to get something out on a daily, even hourly basis, rather than taking the time to gather the facts in order to tell the full story. To illustrate, they cite the Benghazi and IRS missing e-mail controversies as stories that would benefit from some traditional investigative journalism, rather than the daily back-and-forth evidence-free accusations that have dominated discourse on this topic. Immediately after their appearance, Crowley – showing not a trace of irony – hosted a round table of four pundits who traded accusations about who is to blame about the IRS missing e-mails. Former Midd student and political science major Addison DiSesa (who is gainfully employed in communications) pointed me in the direction of Ezra Klein’s Vox video piece claiming that Millennials (that would be Addy’s generation) are “getting smarter about politics.” As evidence, Klein notes that Millennials’ “trust in the presidency has plummeted during [Obama’s] two terms.” This, Klein suggests, is a good thing because it shows Millennials are catching on that the presidency is an inherently weak office. As Addy, a veteran of my presidency course, can surely attest, Klein’s observation regarding the power of the presidency is Basic Neustadt 101. But I’m not sure Millennials’ growing skepticism of the presidency is a sign of increased understanding of the limits of presidential power so much as it is disappointment in what Obama has been able to accomplish. Put another way, it would not surprise me to see Millennials’ fooled again, given the right presidential candidate and political context. That’s what honeymoons are for! Later this week I’ll post a brief analysis of Obama’s falling approval ratings. You might be surprised which previous president’s approval ratings closely mimic the current president’s. Speaking of previous presidents, why is George H. W. Bush smiling? Probably because when he’s not jumping out of airplanes, he’s surrounding himself with agreeable guests. Plus he wears cool socks. This, I submit, is a just reward for arguably the best president not to win reelection! Have a great Sunday (and keep those comments and suggestions coming)! Thanks to a timely heads up by Stanis Moody-Roberts, I was able to catch the HBO premier of “41” two nights ago. It is well worth watching, not so much for breaking new ground – it mostly skimmed the most significant events of Bush’s life – but for providing an intimate glimpse at a man looking back on a career that saw him reach the pinnacle of political power, only to be voted out of office by the people he tried to serve. In watching the movie, I was reminded of just how prepared George H. W. Bush was as president to handle a series of extraordinary foreign policy crises, beginning with the 1989 Tiananmen Square protest in China through the collapse of the Soviet Union and the end of the Cold War to the decision to repel Saddam Hussein’s attempt to annex Kuwait. These were momentous events and, for the most part, he handled them with extraordinary skill. And yet, he was voted out of office, the victim of an economic downturn that had almost nothing to do with his policies. Indeed, it was his decision – one he stands by to this day – to break a campaign promise and raise taxes that helped close the budget deficit and set the stage for the surpluses during Clinton’s second term. For that act, against the backdrop of an economic recession, Bush was booted from office. The film is an extraordinary reminder of how much our evaluations of presidents often turn on events about which they have little control and that even when they do make the “right” decision, they aren’t always rewarded. When Bush ran for president against Ronald Reagan in 1980, detractors chided him as the “resume” candidate – someone who had numerous job experiences, but who hadn’t really shown signs of leadership. However, while it is true that there is no way to truly prepare to be president, Bush came as close as any president in recent memory to taking office with a deep understanding of how government works at the national level and with a strong network of relationships with leading political figures both home and especially abroad. He also was, by all evidence, a man devoted to family, and to the patrician principles instilled in him during his upbringing: duty, honor, love of country and a certain personal code that, among other virtues, precluded drawing attention to one’s self or directly criticizing others. The son of Connecticut Senator Prescott Bush, George grew up in a privileged childhood, much it spend at the family compound at Kennebunkport – a location that Bush clearly loves, and which figures heavily in the film. In 1941 Bush was attending Phillips Academy in Andover, where he was by his own admission a middling student, but otherwise a B.M.O.C (Big Man on Campus) due in no small part to his athletic prowess when the Japanese attacked Pearl Harbor. Although he had been accepted to attend Yale that fall, Bush instead at age 18 immediately enlisted, against his father’s wishes, in the Navy’s aviation wing and became the youngest commissioned pilot in the country at that time. One of the more poignant moments in the film is when Bush recounts getting shot down on a bombing run in the Pacific. Although Bush was able to bail out of his damaged aircraft, both of his crewmates died (one ejected but his parachute failed to open, and the other went down in the craft) – an event that still haunts him. One can’t help but wonder if Bush’s wartime experience – particularly his experience with death – contributed to his decision to halt the carnage the U.S. was inflicting on Saddam Hussein’s military forces during the First Persian Gulf War. After successfully entering the oil business in Texas, Bush embarked on a political career, beginning with an unsuccessful attempt to unseat incumbent Democrat Senator Ralph Yarborough in 1964. He followed that by winning a House seat in 1996 for the 90th Congress, part of a large Republican freshman class that election cycle. Bush then served in a series of high-level appointed positions: Ambassador to the United Nations (1971-73), chair of the RNC during the Watergate period (1973-74 – Bush eventually broke with Nixon); ambassador to the People’s Republic of China (1974-76 – he remembers spending a lot of time bicycling through Beijing), and finally director of the CIA (1976-77 – a key period in which Bush help restore the CIA’s reputation). In 1980, he was Reagan’s main rival for the Republican nomination but despite an unexpectedly strong showing in Iowa, he lost to Reagan in New Hampshire after the famous debate debacle in which an angry Reagan issued his celebrated “I paid for this microphone, Mr. Green” line. Arguably, it was his 8 years as Reagan’s VP that best prepared Bush for the presidency. Although Bush acknowledged that he took a lot of grief for spending so most of his time as VP attending state-level funerals, he recall that he developed relationships with numerous rising leaders, including Mikhail Gorbachev, during these trips. It was that relationship with Gorbachev that helped Bush steer the U.S. through one of the potentially most perilous periods in his presidency: the collapse of the Soviet Union and the end of the Cold War. In “41” Bush recalls that he took tremendous criticism for not flying to Berlin to openly show U.S. support to the thousands of demonstrators who were celebrating the end of Communist rule, symbolized by the tearing down of the Berlin Wall. But, as I suggested in my earlier post on this topic Bush is adamant that appearing to gloat at the moment of East Germany’s collapse would have been the worst possible signal to send, with Gorbachev in such a precarious position trying to manage the transition to democracy in Russia. It might have provoked a military backlash there, diplomatically, as the Soviet empire unraveled. It was this type of prudence that characterized much of Bush’s foreign policy. Ultimately, of course, it was the economic recession, and his breaking of his famous “read my lips” pledge that led to his 1992 loss to Bill Clinton. Although Bush stands by his decision to break the no taxes pledges, he does express regret that he made that original pledge using such forceful and unambiguous language. (The words were actually written by Bush’s speechwriter Peggy Noonan and they are a reminder that while speechwriters are motivated to craft memorable lines, they don’t always think enough about the potential political ramifications of uttering those lines.) That stark wording, Bush acknowledged, made the fallout from breaking the pledge that much more severe. It is clear in the film that Bush still bears the scars from that loss to Clinton. There are two indications of this. First, in the only direct attack on another individual that you will hear from Bush in the film, he flat out states that he doesn’t like H. Ross Perot who, in Bush’s view, cost him the election. (Perot won about 19% of the popular vote in 1992). He also suggests that the media was in the tank for Clinton. These are strong words from a man who does not express very many regrets in his life, and who seems generally to be quite content with what he has accomplished. Clearly, the loss in 1992 still hurts. Interestingly, and perhaps consistent with those patrician values that included an aversion to self-promotion, Bush did not write the standard post-presidential memoirs. Instead, he co-authored a book with his national security adviser Brent Scowcroft that focuses almost exclusively on foreign affairs. And that’s why “41” is well worth watching – it provides an intimate glimpse into a man who has spent much of his life deflecting personal attention even as he served in the most high profile position in the world. Instead he chose to raise our tax. When we saw what he had done. We voted out “Forty One”. Is George H. W. Bush the Best President Not To Win Reelection? George H. W. Bush turned 88 yesterday, and the milestone got me thinking: is he the best president not to win reelection? His defeat was caused in large part by the public perception that although the economy was coming out of a recession, economic growth was more sluggish than it actually was. In addition, after 12 years of Republican control of the White House, there was growing sentiment that it was time for a partisan change. Bush was also painted by Clinton as out of touch (many will remember his evident bafflement over seeing a grocery checkout scanner), and castigated by some conservatives for breaking his “no new taxes” pledge. Despite this, there is evidence suggesting that had Bush begun campaigning earlier and more effectively in 1992 (he installed Secretary of State James Baker as campaign manager too late to overcome Clinton’s early polling lead), he might have won reelection. Bush’s most publicized successes as President came in foreign policy. In an almost bloodless campaign, he authorized the use of military force to remove Panamanian dictator Manuel Noriega from power. And when in 1990 Saddam Hussein annexed Kuwait as a possible prelude to invading Saudi Arabia, rather than fulfilling Margaret Thatcher’s fears that he might “go wobbly”, Bush instead put together a domestic and international political and military coalition that drove Hussein out of Kuwait in less than a month of combat and with a minimal loss of American lives. (We forget just how close was the vote in Congress giving Bush authority to use military force against Hussein; the resolution passed the Senate by a scant 5 votes, 52-47. This was a far closer vote than what Bush’s son received when he sought congressional approval to go to war in Iraq.) Most notably, when Iraq’s military forces were routed and Hussein most vulnerable, Bush chose to halt the military carnage rather than pursue regime change. His decision not to remove Hussein from power was heavily criticized at the time, and for years after, but today, as the violence continues in post-invasion Iraq, many now laud Bush’s prudence and foresight. Bush also presided with deceptive ease over the end of the Cold War; we now view German reunification as the natural result of the collapse of East Germany, but had Bush overplayed his hand, he could easily have undercut Soviet leader Mikhail Gorbachev’s political support back home and triggered a backlash among European nations to the specter of a unified Germany. Similarly, when the Soviet Union subsequently dissolved in 1991, Bush again confronted a potentially volatile period as Eastern bloc nations, freed from the yoke of Soviet dominance, struggled to remake themselves as democracies. If Bush’s leadership during this time lacked Reagan’s inspirational flourishes, he more than compensated by exercising a steady, if understated, diplomatic hand. He recognized, despite pressure from critics to more actively intervene in the restructuring of Eastern Europe, that leadership sometimes means doing less, not more. Bush’s political downfall, however, was rooted in domestic affairs, particularly the economy, which slid into a recession on his watch. As with all modern presidents, he was held accountable for the state of the economy although he lacked many tools to influence it. Indeed, one of his most courageous but politically disastrous acts was to negotiate, in the face of growing budget deficit, a budget deal with Democrats in Congress that included additional revenue – thus breaking his famous “read my lips, no new taxes” pledge that was a cornerstone of his 1988 campaign. For that act of treason he was pilloried by the Gingrich-wing of the Republican Party while receiving scant credit from liberals. Sensing Bush’s political vulnerability, social conservative Pat Buchanan, touting his pitchfork brigade, unsuccessfully challenged the sitting President for the Republican nomination. That was an early indication that Bush was in electoral trouble. With hindsight, of course, the Bush tax hike served as a downpayment that contributed to the budget surplus that was briefly enjoyed during Clinton’s last term. Since leaving the White House Bush has largely stayed out of the limelight, except for his occasional leap from airplanes (he is promising at least one more jump on his 90th birthday). 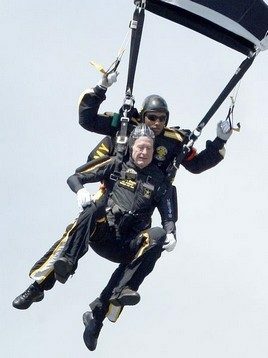 Here he is jumping on his 85th birthday. Rather than actively engage in national politics, he has limited his public involvement to bipartisan goodwill missions. Notably, he kept a very low profile during his son’s eight years as president. Rather than engaging in national politics, he spends much of his time on the water at Kennebunkport, Maine, and enjoying his grandchildren. He did recently attend the unveiling of his son’s portrait at the White House. So, is he the best president not to win reelection? By my count, there have been at least 11 polls ranking the presidents since Bush left office. His aggregate place in the rankings is 21st (standard deviation 3.2), with his highest ranking 18th (twice) and one poll placing him as low as 31st. Typically he is clustered in a pack that includes Taft, Martin Van Buren and the man who defeated him, Bill Clinton. I’ve written previously about the unreliability of these rankings, but there does not seem to be any evidence that Bush’s historical standing will change appreciably in the foreseeable future – his presidency, rightly or not, is deemed average. Interestingly, in the aggregate presidential rankings, only the two Adamses – John and his son John Quincy – rank ahead of Bush among those presidents who sought reelection but were defeated. Both Adamses may benefit historically due to their accomplishments outside the presidential office – an advantage Bush does not enjoy. Here he is reading that letter and talking about his presidency more generally. The exchange in this video between Jenna and Bush regarding “the Bieb” is priceless. George H. W. Bush. Possibly the best president we never reelected – and a pretty good grandfather too. Here’s to you, Poppy. May you enjoy many more birthdays (and sky dives) to come! P.S. For a discussion of his son’s rankings, see my analysis here.